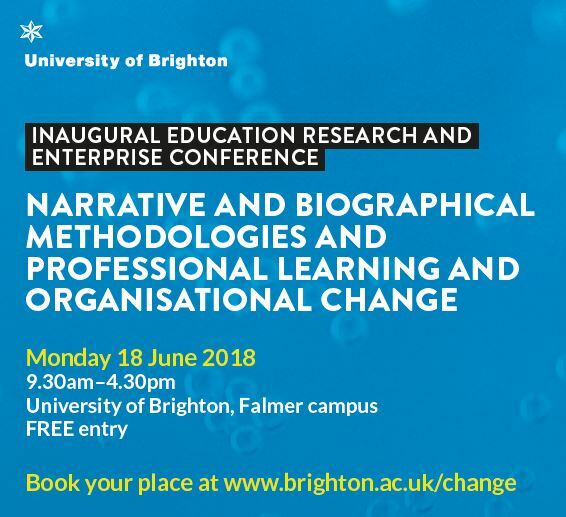 The University of Brighton will host its Inaugural Education Research and Enterprise Conference on Monday June 18th. The conference will reflect the interests of two of the Research and Enterprise Groups within the School of Education, namely: Narrative and Biographical Research Methodologies and also Pedagogy, Professional Learning and Organisational Change. The conference will focus on methodological and empirical applications in these areas and more broadly on the changing conditions and practice within education and social systems. The conference aims to showcase research being undertaken in the fields of Narrative and Biographical Research Methodologies and Pedagogy, Professional Learning and Organisational Change. It will enable academics and students studying and researching these fields to learn from, and be inspired by others, and to foster broader collaborations. The day will comprise a mixture of keynotes, seminars, panel discussions and poster displays. We hope you will join us for what promises to be an exciting and intellectually stimulating day. The programme for this event is still in development.